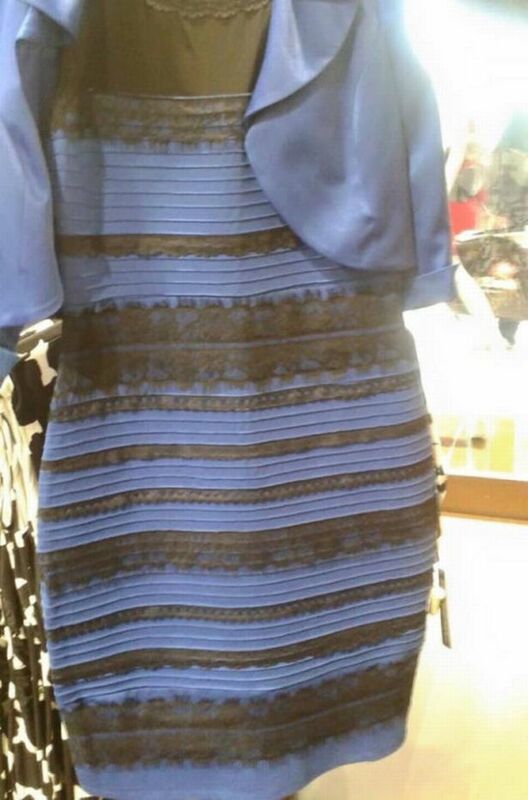 Over a year ago a picture of a dress was posted on Tumblr and the internet began a crazy debate about the colors of the dress. Is the dress white and gold, or black and blue? 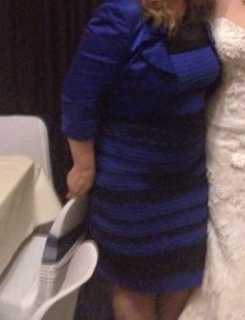 In person the dress is actually black and blue. The lightning of this picture is what throws people off and confuses them. This photo has a bluish tint to it, which makes people see the blue as white, and the black as gold. This has to do with the rods and cones in our retinas. The difference in color perception is most likely related to how our brains interpret the quantity of light that comes into our retinas. Another factor as to why people see white and gold is because of the lighting in the picture. People see a white and gold dress in dark shadow, other people see a blue and black dress, washed out in a bright light, lastly some people see one interpretation, and then switch to the other. Shadows also play into how we perceive the colors of the dress. Our color perception really depends on the amount of light in a room. "In this second photograph, the white wedding dress, dark curtains, visible skin tones, and body shadows help us accurately judge the amount of ambient light in the room" (New York Times).